Dr. Fulop-Goodling offers several different whitening systems to her patients in NY. When trays with bleach are used, impressions are taken and the resulting trays are filled with a bleaching agent. Results can be seen as early as 3 days. Varying agents can be used and this method is an extremely effective way of whitening sensitive teeth. This method can be used on patients after the full eruption of their second molars, around 12 years of age. 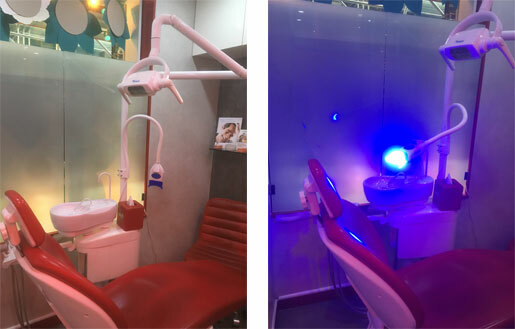 When the in-office bleaching method is used, a stronger agent is painted on the teeth and then activated with a plasma light. Depending on the strength used, the agent can whiten teeth up to 8 to 10 shades lighter. This method is wonderful for patients who can not tolerate wearing a tray or who have a special occasion coming up soon. Dr. Smiles is the newest alternative to teeth whitening that Dr. Jacquie developed herself! Dr. Smiles uses the most cutting edge technology in teeth whitening and is only available by your dentist though in-office treatments. It is the first proprietary patented system, allowing patients whiter teeth, faster and without sensitivity. Your smile is one of the first things people notice and having a brighter and whiter smile can communicate to others that you are a confident, healthy, and happy person. That is why having a whiter smile can boost your confidence and self-esteem. With a whiter smile, you’ll be ready for anything that comes your way. Whether you want your teeth whiter right now or over a few nights while you sleep, this could be the right treatment for you! The Zoom! In-Office Whitening System uses proprietary technology to whiten your teeth an average of eight shades* in a little over an hour while you relax at our office. It’s ideal for anyone who wants immediate results. The Zoom Take-Home Whitening System uses a revolutionary patent-pending gel to whiten your teeth an average of six shades in three nights. * And you may go even lighter with additional applications. Start on Friday and by Monday you’ll have a whole new smile. Why waste time with strips or paint-on gels? 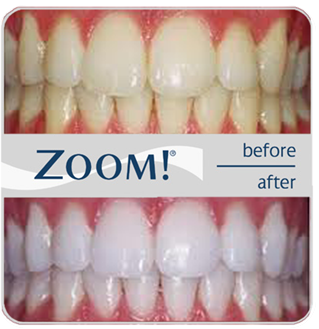 Get your teeth whiter in a fraction of the time with Zoom! Zoom teeth whitening is a bleaching process that lightens discoloration of enamel and dentin. Almost anyone. However, treatment may not be as effective for some as it is for others. Your dental professional can determine if you are a viable candidate for this procedure through a thorough oral exam, including a shade assessment. More people than you might imagine. A bright, sparkling smile can make a big difference for everyone. The Zoom! Whitening System makes it easier and faster than ever before. Yes, extensive research and clinical studies indicate that Zoom whitening under the supervision of a dentist is safe. In fact, many dentists consider whitening the safest cosmetic dental procedure available. As with any tooth whitening product, Zoom! is not recommended for children under 13 years of age and pregnant or lactating women. The Zoom! light-activated whitening gel’s active ingredient is Hydrogen Peroxide. As the Hydrogen Peroxide gel is broken down, oxygen enters the enamel and dentin, bleaching colored substances while the structure of the tooth is unchanged. What does a patient experience during the Zoom procedure? 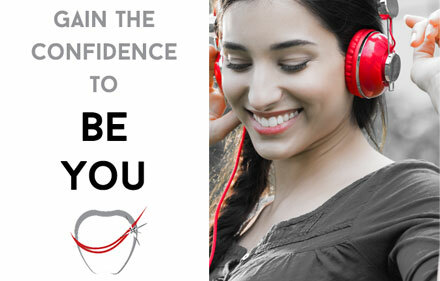 During the Zoom teeth whitening procedure, NYC patients may comfortably watch a movie or listen to music. Many actually fall asleep. Individuals with a strong gag reflex or anxiety may have difficulty undergoing the entire procedure. How is exposure to the Zoom light controlled? The Zoom! procedure requires that all soft tissue in and around the mouth be protected. Protective eyewear is required during the procedure. Light sensitive individuals including those undergoing PUVA (Psoralen+UV Radiation) therapy or other photo-chemotherapy, as well as patients with melanoma, should not undergo the Zoom! in-office procedure. Also patients taking any light sensitive drugs or substances, whether over-the-counter, prescription or homeopathic, should consult their primary physician prior to procedure. Sensitivity during the treatment may occur with some patients. The Zoom! lights generates minimal heat which is the usual source for discomfort. On rare occasions, minor tingling sensations are experienced immediately after the procedure but always dissipate. Dr. Jacquie Smiles offers NYC patients with Zoom! Teeth Whitening System. Setup your appointment today at her convenient location near Midtown Manhattan. Can you tell me about teeth whitening? Many people in NY and NJ area have had their teeth whitened and millions more are thinking about it. The desire for a younger brighter smile with whiter teeth is easier than ever to attain today. 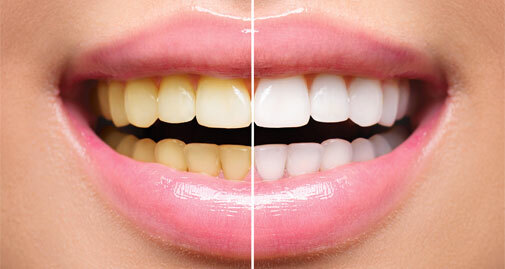 Tooth whitening safely lightens the color of most teeth. Teeth darkened naturally from aging and food additives, as well as tobacco, can be easily lightened while staining from fluorosis and tetracycline are not as dramatic. There are many different ways of whitening your teeth. There are take-home kits and in-office bleaching systems performed in an hour. The most effective and safest method of tooth whitening is dentist-supervised. Dr. Jacquie Smiles offers teeth whitening services for her patients in NY and NJ. None of us are exempt from tooth discoloration because the culprits are all so common. Some staining substances include soft drinks, juices, coffee, tee, red wines, berries, tomato sauce, soy sauce and smoking. Some discoloration is also a natural result of aging and long-term use of some medications. Several studies during the past five years have proven whitening to be safe and effective. The American Dental Association has granted its seal of approval to some tooth whitening products. Some patients may experience slight gum irritation or tooth sensitivity, which will resolve when the treatment ends. The active ingredient in most of the whitening agents is carbamide peroxide or hydrogen peroxide in varying percentage concentrations. When water contacts this white crystal, the release of hydrogen peroxide lightens the teeth. Successful whitening depends also on emulsions and propagators present in quality bleaching agents. First, Dr. Fulop-Goodling will determine whether you are a candidate for tooth bleaching and what type of bleaching system would provide the best results. If you’re in a hurry for whiter teeth, you may decide to have your teeth lightened immediately, by using an in-office bleaching system for that purpose. However, most patients choose dentist-supervised at-home bleaching, which is more economical and provides the same, if not better, results. Dr. Fulop-Goodling will take impressions of your teeth to create a whitening appliance for you. The whitening appliance is like a mouthguard that is custom made for each patient. It is lightweight is comfortable to wear while awake or sleeping. Some whitening systems recommend whitening your teeth from two to four hours a day. Generally this type of system requires three to six weeks to complete, and works best on patients with sensitive teeth. Other systems recommend whitening at night while you sleep. This type of system usually requires less than one week to complete. Lightness will depend on your personal habits such as smoking and drinking coffee and tea, but can last for many years. Some people will choose to get a touch up if they notice a change in color. Is teeth whitening a popular procedure? Dentists report that 95% of their patients dislike the color of their teeth. Because years of research reveals that supervised whitening is safe, simple and effective it is now the highest demanded procedure for dental patients. Are the whitening systems purchased over-the-counter effective? If the toothpaste with a whitening agent in it works well whitening your teeth, then the O-T-C whitening systems will also work well. Stonger whitening agents are regulated and dispensed by a dentist. Also, whitening agents purchased in a drugstore might not be strong enough to give your desired results. You have to look your best for the wedding photos! The perfect smile would complete this perfect picture! Many brides-to-be are adding the services of an orthodontist to their wedding planner list. Come in for a complimentary whitening consultation and enhancement imaging to see if we can give you your perfect smile. We have several convenient locations throughout NY and NJ areas. Dr. Jacqueline Fulop-Goodling helps brides create the smile of their dreams which live on every time they smile and each time they open their wedding album. Don’t be dissappointed with your smile. Dr. Fulop-Goodling can help straighten and whiten your teeth for your special day. It is a perfect gift a bride can give to herself. Dr. Jacqueline Fulop-Goodling knows first-hand how important that special day and the photos commemorating it will be. Dr. Fulop-Goodling ‘s best advice to any bride-to-be is to plan well and enjoy all of the planning because it comes and goes quickly. For brides to be who are unhappy with their smiles, Dr. Fulop-Goodling recommends Invisalign , the new wave of orthodontics that straighten teeth without braces, and whitening. She straightened and whitened her teeth before her wedding day. It made such a difference in the photos. She even straightened the teeth of two of her bridesmaids! Dr. Fulop-Goodling calls Invisalign “computerized orthodontics,” because impressions of patients’ teeth are scanned into a computer and teeth are moved using 3-D digital animation. Clear trays, known as aligners, are made to match the models fabricated from the digital computerized images. A patient receives a series of trays, and with each tray, teeth move a little more. The number of trays depends upon the amount of crowding or spacing a patient has. Research done by Invisalign reveals that 80% of patients with a bad bite or “malocclusion” can be treated and corrected with Invisalign . Dr. Fulop-Goodling was one of the first orthodontists to use the Invisalign system of orthodontics, and she has a wealth of experience with this new technology. In fact, in 2003, 2004 and this year, Invisalign presented Dr. Fulop-Goodling with an award for treating the most patients in the New York area. Dr. Fulop-Goodling offers several different whitening systems for brides to be. When trays with bleach are used, impressions are taken and the resulting trays are filled with a bleaching agent. With an in-office whitening system, a stronger agent and a plasma light is used. Depending on the strength, your teeth can be whitened 8 to 10 shades lighter.